I know I’m getting older. My body tells me so everyday. Muscles hurt and don’t work as well as they used to. Naps, which used to be pleasurable excesses, are now annoying necessities. This year at Burning Man I practically needed a crane to get myself up off the playa surface after watching the Temple burn. But I still went to Burning Man, and I still felt younger and more alive when I got there. It’s part of the magic of being a Burner – no matter how old you are or believe you are. I met a Sunrise Burners reader who’s 75 and returning to Black Rock City for the first time in many years – in part because of this blog site. His eyes were bright with excitement contemplating his week in the desert, as were mine as we chatted. But it doesn’t always start out that way – at least not for me. I arrive at the playa still full of worries and concerns from real life – how can I pay all the bills on the limited income of retirees, will my vehicles make it through another year, have I done enough to prepare us in case we get sick or hurt? I worry whether the RV has enough water, fuel and holding tank room to last 10 days in the desert. I wonder what I’m even doing here, out in this harsh environment — away from the comforts of home, the love of my dogs, my daily New York Times. I question whether I’ll have the stamina to carry lanterns out and pick them up. It takes a couple of days to get over these anxieties and begin to see the wonder of Burning Man. People have come out to the desert with art that they want to share with me, and all I have to do is open my eyes and take it all in. 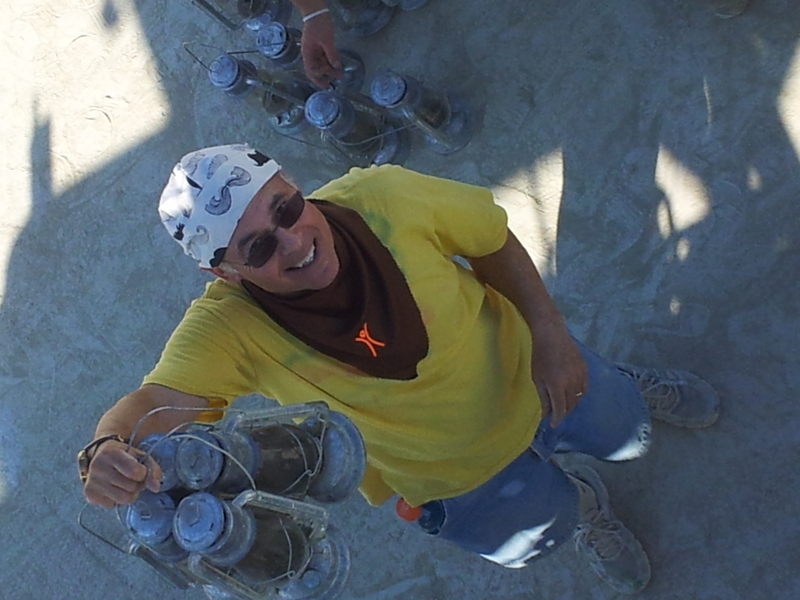 Joyously picking up lamps on the playa — my main job at Lamplighters. I put one foot in front of another and go out to pick up lamps that first morning. Astounding. I can still actually handle the job; it feels good to walk the playa, accomplish my task and look back to see the job done. Others in my camp don’t see our age as a weakness – they look up to us, and want our help and advice. And our playa friends energize us with the love and joy they bring to Burning Man. What could be better? The fog of anxiety and worry takes a couple of days to lift fully, but once it does I start smiling from the inside. Sure, there are problems – I’m constantly losing Lashes as we traverse the playa, and I’ve grown to depend on her presence after nearly 50 years of marriage. But she always turns up, and our love is as intense as it’s ever been when we’re together in the desert. I also have a tendency to struggle with bike problems – in part because I’m way too cheap to bring a decent bike to the playa, and I always try to stretch the life of each of my junker bikes beyond its endurance. But the free bike shops and knowledgeable neighbors band-aid my vehicle back together so I can keep pedaling throughout the week. Meanwhile, I learn a little more about bicycle maintenance each year. By the time Burning Man ends and exodus commences, I’m a committed Burner once again. On the way home, we talk about next year – new lights we’ll buy, costumes we’ll design, plans we’ll make to see more of the art next year. I’ve lost the fog of worry, and for weeks after I return, life seems so much better. I do my best to hold on to that Burner mentality throughout the year. Worries do eventually return (that pile of mail waiting for me contains all the bills we’ve accrued getting ready for the Burn, and our property tax invoices as well), but for now, I’m a Burner happily floating through a life full of art, free booze and uncritical friends.